Author Benjamin Myers has been awarded the Walter Scott Prize for historical fiction. He received his £25,000 award for his novel, The Gallows Pole, based on the true story of the Cragg Vale Coiners. The presentation was made by last year's winner, Sebastian Barry, at the Borders Book Festival in Melrose on Saturday. Myers said he would spend his winnings on "going to see the original line-up of Guns N' Roses in Reykjavik". He also planned to have a break after publishing seven books in eight years, to sit in his back garden and "listen to birdsong". The prize was judged by a group including journalists James Naughtie, Kirsty Wark and Kate Figes, and writers Katharine Grant and Elizabeth Laird. 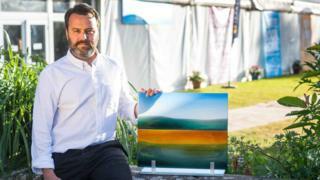 Alistair Moffat, the book festival director and chairman of the judging panel, said The Gallows Pole was a "roaring furnace of a novel". It follows the story of a gang of men who forge coins in Yorkshire in the 18th Century - a crime punishable by death. Mr Moffat said: "In telling a big story about a small place, Benjamin Myers portrays social upheavals which have a sharp contemporary echo, as well as bringing to light a little-known and fascinating fragment of rural English history, through his portrayal of the lawless 'coiners' and their charismatic warlord pitting themselves against the massed forces of industrial and social change. "He meets the challenge for every author of historical fiction - bringing alive the past and speaking forcefully to the readers of today." The Gallows Pole was one of six books shortlisted for the award. The others were Jennifer Egan's Manhattan Beach; Jane Harris' Sugar Money; Paul Lynch's Grace; Patrick McGrath's The Wardrobe Mistress and Rachel Malik's Miss Boston and Miss Hargreaves. Each of the shortlisted novelists received £1,000.